Posted on April 18, 2018 by K.J. Located on St. Patrick’s Isle, Peel was built in the 11th century by Vikings under the rule of our favorite king, Magnus Barefoot. Initially the castle was a Celtic religious site, but when Magnus’ forces arrived they replaced those with wood battlements. The sandstone walls did not appear until the 14th century. 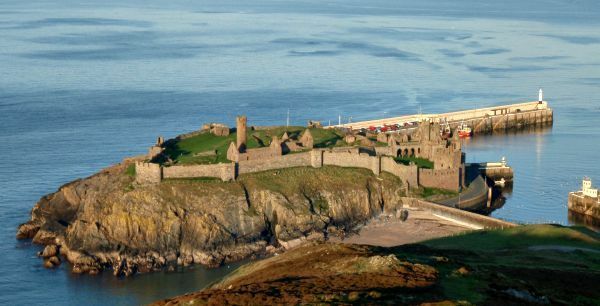 There are so many things that I want to tell you about Castle Peel and the role it plays in The Manx but the spoilers would pile up too high. Instead I’ll leave you with a photo of it and you can imagine your own tales that might occur here. Posted on April 16, 2018 by K.J. The book also takes us back into Manx history. King Magnus the Barefoot was king of Norway 1093-1103, during this time he was on the Isle of Man. King Magnus was ruthless in the battles he waged. He dominated much of the coastal area around the Irish sea. He had forts built on Man and he spent much of his time there while he was busy conquering the Irish Sea. His daughters, Ragnhild and Tora (I changed this name to Thora in the book), will play major parts in the past as well, along with a few other characters from his court. The extent of historical accuracy does end there. I have used the names from the past and taken a lot of artistic liberty with their characters. I also followed some of the historical narrative to build personalities for them, but that’s about it. There have been days that I spent hours looking for names getting lost in the histories and the side trips of the internet. I am still building new characters so if you are Manx and know of a few good places, or people, that you think should be included. Leave a comment. I’d love to learn more. Posted on April 3, 2018 by K.J. Today’s post, for #atozchallenge, is dedicated to the letter C — for CAT, and my fantasy novel, The Manx. The manx cat is tailless and are thought to come from the Isle of Man. At one time there was a relatively large population of manx on the island, but in recent years it has been declining. When the waters receded Noah dropped the cat off on the Isle of Man to find some copper nails. I don’t think the cat ever found the nails because it is still without a tail. The Manx cat is not the only Manx on the Isle of Man. The title of my book is named for the native peoples of the island, the Manx or Manxies. They have cultural origins with the Celtics and their language is related to Irish and Scottish Gaelic although it developed in seclusion since about the 700’s. The Manx (my book) is inspired by the folktales and history of the island. You will find bugganes, Little People, castles, witches, and much more. Tomorrow, with the letter “D” I will introduce you to one of the characters in the book, Donal. Until then…. Posted on January 4, 2016 by K.J. We just crossed into a new year…are you excited? If you said, “YES!” then I’m with you. I am really looking forward to this year and what secrets it holds.The future is never certain, but I will make the best of it. My plan for 2016 is pretty simple; publish my debut novel The Manx. This book has been in the works for a few years and kept on the back burner while I dug down into the craft of writing. Developing character and story arcs, along with structure and plot are all necessary for developing a good book, but when I started The Manx I knew nothing about writing a book and soon discovered that it needed a little work. Since its inception (around 2013), I have kept it safely on the shelf just waiting for the day I had enough confidence (and know-how) to pull it back out and dive in. The Manx is coming out to play and its going to be awesome! If you like fairy tales this will be your kind of read. I won’t reveal any more right now, but look to future posts as I introduce you to the Isle of Man and its people, the Manx. Until then, enjoy the beginnings of this new year. Make your resolutions. Keep them or not. No matter what, make the best of everything that happens this year. It will be the one, and only, time you get to live 2016.